Aloha! We’re back and kicking off an updated “What’s what!” of weekly newsletters! Now I know, the first thing that comes to mind is. 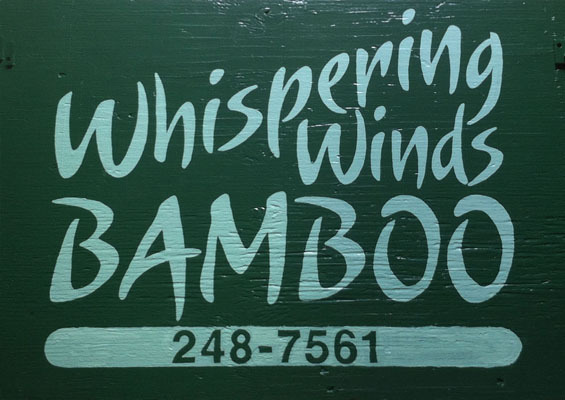 “Whispering Winds Weekly? But the last update was nearly two months ago!” We came together with a new format and vision for our blog, but didn’t foresee the problems with getting it written and published while dealing with our normal busy daily farm responsibilities. So we returned without much of a big “BANG!” explosion in our web presence and activity; but that’s part of our process of cleaning out the cobwebs and dusting off the shelves of this blog so to speak. Without further adieu I am proud to present the first Whispering Winds Weekly update on a consistent basis. This week a lot has transpired! We’ve been busy working hard on our infrastructure! 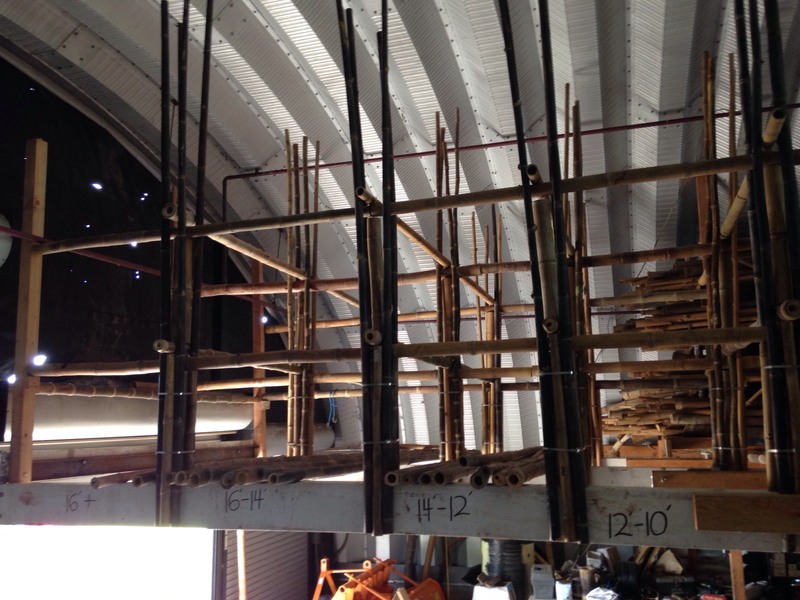 Creating a better work experience in our Quonset hut through building additional shelving for our inventory of cured bamboo timber poles, as well as developing and installing new railings for our farmhouse structure. We also had a mid week day in the garden where we transformed garden beds, working to save and nurture the existing plants. 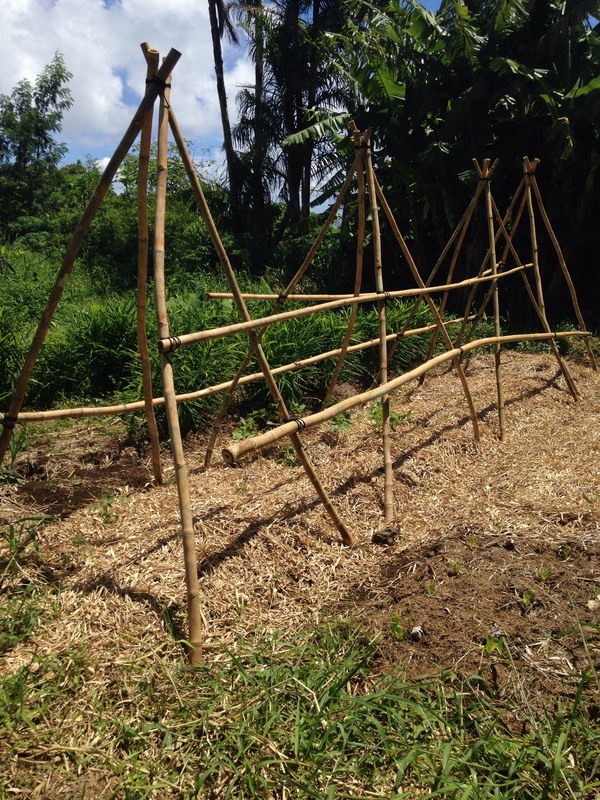 We created and put together a bamboo trellis design effectively maximizing the space in our garden and allowing our ground cover (Sweet potato, Pumpkin, Squash, etc.) to climb up the trellis. To finish up the week, we all came together for our third consecutive week of a farm-wide produce harvest. A lot of exciting work goes into harvest days, and we are eager to share the experience with you in detail in the coming weeks. On top of all of that action this week on the farm, the bosses have decided to leave the farm on different trips. Leaving the farm solely in our care! So here’s a shout out to the three amazing people that we love so dearly and are missing by the minute. Left to right: Rich, 50lb Jackfruit, Ryan, Virginia. Let this serve as a “thanks” for letting us throw this awesome party while you were gone. The whole neighborhood came. It. Was. Intense. Also, please let this serve as an apology. We couldn’t help ourselves. We are Kipahooligans, afterall. Here’s a photo of our shelves in progress. They follow our traditional “Column” style of construction. This being a center 4″ diameter “Mid-post” at the given length, being 2 feet in this example. We then surround each “Mid-post” by four 2.5-3″ diameter “Uprights” and by four 2″ “Spacers.” Once the uprights and spacers are in place around the mid-post, a steel band is secured tightly around the column to ensure that each pole is tightly supporting and strengthening one another. The numbers displayed on the white cross beam are used to signify the length of pole one would find in that given section. Each section is three cubbies tall, going from the smallest diameter poles near the ceiling, to the largest diameter poles resting on the white beam itself. These particular shelves are going to be our main storage location for our black bamboo. 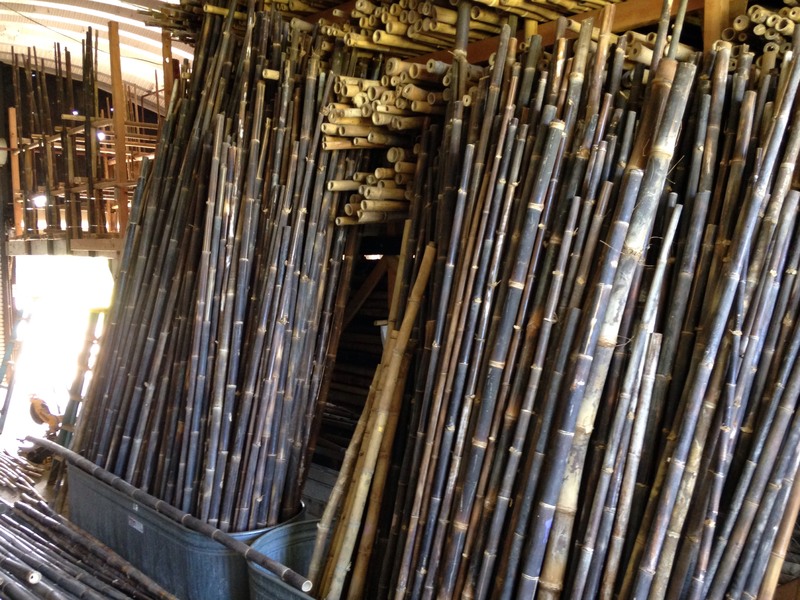 These are the most valuable timber poles in our selection. Highly valued due to their unique and distinct appearance. While all green bamboo will eventually cure and dry as a blonde pole, the black bamboo maintains its coloration post-harvest. Here it is, patiently awaiting it’s new home. The next thing I would love to highlight from our week here are our new farmhouse railings! While we would love to make them exclusively out of bamboo, we have some silly building code to follow. Designed and installed all thanks to one of our bamboo handymen, Johno! Our previous railings were becoming slightly worn and dilapidated through years of weather and wear. The poles used were untreated and still withheld. Bamboo strong! 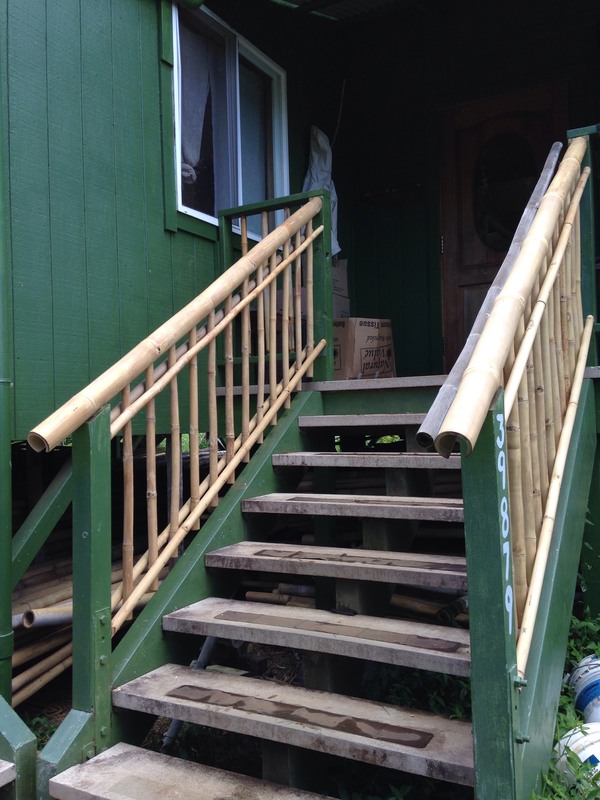 Though, the poles used for the new railings have been borate-pressure treated as well as coated with a newly designed, special “Nano-coating” that further helps protect the bamboo, as well as keeps it in it’s pristine looking condition. Now, normally our weekly dedicated garden day is full of energy, passion, and excitement! This week was no different, save for our lack of a fearless leader in Virginia! She’s gone away on a trip, and was not here to help us. While we missed the loving and numerous “GIVE ‘UMS!” and subtle reminders that “Wasted mulch is a sin!” Thankfully through dutiful and patient guidance in past months by way of Virginia; we (and the plants) came out better than before! Go us! As well as the newly designed trellis. This trellis design was put together solely using raw bamboo timber poles and traditional lashing techniques. The specific lash used was a “square lashing;” courtesy of our resident knot-master James. Thank you for the update. The organization of the bamboo looks great. Railings looks nice and strong. I would like to hear specific about gardening and orchard harvest. Someday I want to retire from my airline job and come be your chef. I would prepare you all great meals with pleasure! I’m sure they would be delicious, Beverly! Thank you for your response. 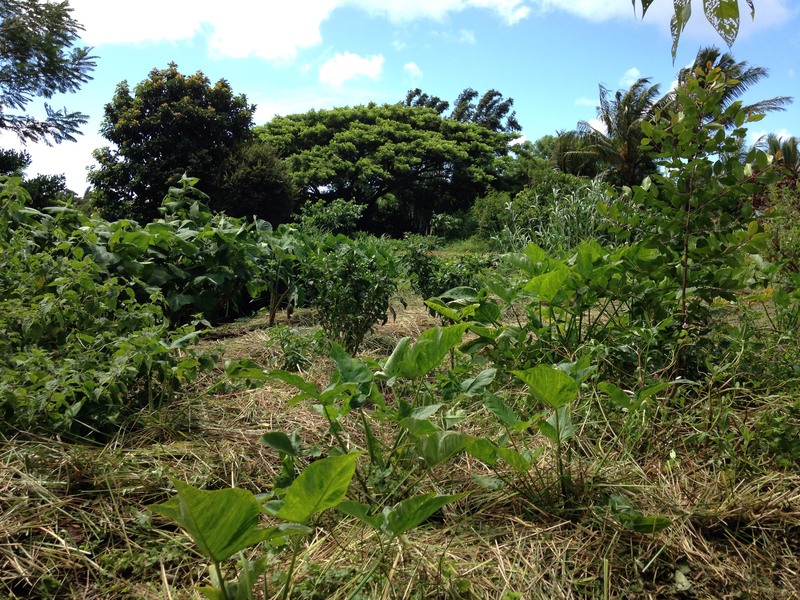 You’re in luck, as today we’ll be posting an update focused on our produce harvest! Can’t wait to tour the whole place in person!